A small biotechnology company was ready to move its vaccine from the laboratory to clinical trials. Even though the company lacked its own manufacturing facilities, it wasn’t ready to put its fate into the hands of a third party. The company’s solution? Buying a mobile adaptive laboratory from Germfree Laboratories. Germfree is known for mobile laboratories, which can provide “as needed” access to laboratory facilities, as well as for modular laboratories, which can allow conventional buildings to incorporate customized sterile laboratories quickly, within months, without the cost of rebuilding. Both the mobile and the modular options have the virtue of speed, which is appropriate, given that Germfree is headquartered in Ormond Beach, FL, the city that became known as the “Birthplace of Speed” because it hosted some of earliest timed automobile races in America. When Germfree began 55 years ago, it manufactured isolators for sterility testing and biosafety cabinets for hospital pharmacies. It expanded to customized containment equipment in the late 1980s, working with the U.S. military to design laboratories that were dropped by parachute into remote locations. In the early 2000s, as the need for containment and complexity increased, the company developed mobile BSL-3 laboratories. New ISO high cube refrigerated shipping containers provide Germfree with the building blocks for its laboratories. “Every country can receive these,” Serle points out. Germfree’s mobile laboratories have been shipped to Singapore, Saudi Arabia, and Senegal (where the company has offices), as well as to Nigeria and other nations. 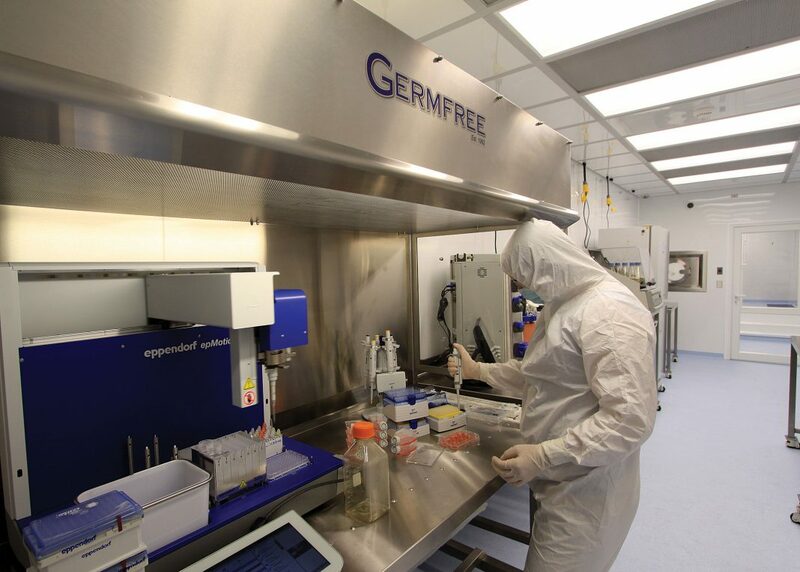 Germfree’s history with hospital pharmacies and military laboratory biocontainment facilities served the company well, easing its transition to biotech laboratories. The company’s modular and mobile approach to biotech laboratories proved to be advantageous when cGMP standards became more rigorous. To illustrate how cGMP standards relate to Germfree’s fortunes, Serle cites the company’s work with a drug manufacturer: “The laboratory space for clinical trials was housed in an aging, multistory building that couldn’t meet the more rigorous cGMP standards. Rather than demolishing the building, the client ordered a modular laboratory.” After the new laboratory is tested in Germfree’s factory and is fully functional, it will be disassembled and moved to the site for installation and validation. While buying mobile or modular laboratories is less costly than building new facilities, the real benefit is knowing the laboratory will go online on time and on budget, Serle tells GEN. “How many construction projects do that?” he asks. The difference between building a laboratory and buying a mobile or modular laboratory is that the latter are products. They have a firm fixed price and undergo installation qualification (IQ) and operation qualification (OQ) testing. Once delivered, they can be fully functional in a few weeks to a few months, depending on where in the world they are delivered. Building a laboratory, in contrast, requires months to years. Serle says Germfree’s mobile work for the military was instructive: “We learned what works in terms of designs and products. In the early days, durability was an issue. A laboratory would end up with a crack in the wall or wouldn’t be airtight after delivery.” Those problems caused Germfree to develop a continuous improvement program that focuses on known problems during the design, implementation, and testing of each unit “to ensure they didn’t happen again.” Germfree also established a mentor program. Lessons learned from those days include using 40 × 12-foot sheets of high-performance polymer to minimize seams and enhance cleanability, and merging the floor into the wall. Gang boxes (the boxes behind walls that house electrical outlets and switches) are designed to prevent air leakage and are helium-tested. As a result, Germfree’s containment units pass the required pressure tests. Founded by a physician intent on eliminating surgical infections, the company has a heritage in environmental control. Today, the company’s reputation depends on its ability to construct controlled environments. Serle himself is the past president of the Controlled Environment Testing Association, and other staffers are active in the International Society for Pharmaceutical Engineering. Many staffers have first-hand expertise in regulatory affairs. Germfree designs, engineers, and manufactures transportable pro-duction units to deliver rapid and flexible solutions. These units may provide separate, short-term facilities, which are often suitable for small-batch applications and the early stages of drug development. Germfree is especially focused on the biopharmaceutical industry and plans to introduce several products for this industry in the coming year. “There’s a lot of need among biopharma customers…those with one or two projects, those with researchers coming out of graduate school, and large companies needing more flexibility,” Serle asserts. Mobile laboratories and modular buildings, he stresses, provide the quick access that startup companies need, and help larger organizations minimize risk by segregating upstream work from sterile manufacturing space. Getting started is merely a matter of deciding what you want in a mobile laboratory or modular space. Germfree delivers the building with already-installed generic laboratory equipment—refrigerators, freezers, and incubators, for instance. Customers set up their laboratories with their own analytical and benchtop equipment, and perform the process qualification to ensure their process works in the space. “Every setup is different, and they all have challenges,” Serle points out. Setup variables include process requirements, the number of people that will use the space, the tasks to be accomplished in-house (or outsourced), and the extent to which laboratory staff will require additional support. This is particularly important for laboratories on the far reaches of campuses or in remote locations. Mobile laboratories and modular facilities aren’t the right answer for every company, of course. Large manufacturing needs still are best met with brick-and-mortar buildings. Companies with smaller laboratory or manufacturing needs, however, may benefit. Mobile laboratories offer about 420 square feet, whereas modular buildings can be connected for up to 15,000 square feet of laboratory or manufacturing space. Looking toward the future, Serle says, “Germfree would like to be more involved in biotech incubators and university laboratories, providing spaces that can be reconfigured easily as needs change.” Disposable manufacturing also offers opportunities. “Ninety percent of the products we’re supplying are designed around disposable manufacturing,” Serle notes. “It’s the way of the future. 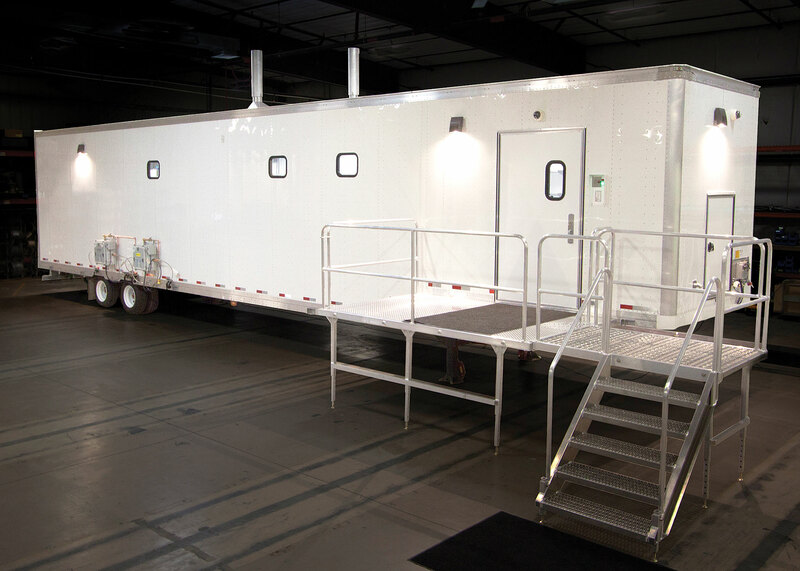 Germfree Laboratories’ BioPharma Trailers can be deployed for a range of applications where a dedicated or limited-scale cGMP-compliant facility is required. This image, an interior view, suggests how a mobile laboratory may provide cleanroom process areas as well as any needed containment. Focus: Germfree Laboratories manufactures mobile laboratories and modular laboratory and manufacturing space specifically designed for the biopharmaceutical industry and for hospital pharmacies.